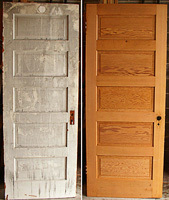 Houck's Process Stripping Center specializes in preserving the historical beauty of many different wood and metal items. If you would like to remove the accumulated layers of paint and other finishes from your doors, cherished antiquities, everyday furniture or specialty items call us today at: 503-232-5151. Before you even think about trying to sand or use any harsh chemical "peels" on a valuable item, consider the time, effort and possible hazards. Why waste precious time tediously trying to remove multiple layers of paint or nearly impossible lacquers? Consider Houck's Process Stripping Center. We are a state-of-the-art, 3,000 sq. foot facility capable of handling most renovation and restoration projects. If you have a project that you've been considering restoring, but are unsure about how to proceed, or are afraid of damaging the ornamental work, call Houcks Process Stripping Center. We pride ourselves in preserving the life of your furniture. We will answer all of your questions regarding how we can make restoring your special finds and cherished antiquities an easy and affordable experience. Give us a call today at 503-232-5151. Reclaim the inner beauty of your favorite items.